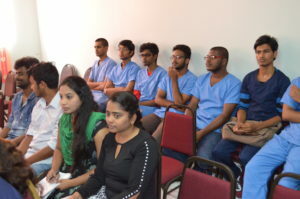 The Orientation day (Summer 2018 semester) for the School of Medicine and School of Prehealth was held on Thursday, 10th May from 8.45 am onwards in the school auditorium (Room 315). This was the first time the University had organized a comprehensive orientation program with a diversity of speakers for students. All Basic Science and Prehealth students participated. Dr Klir in his opening address provided an overview of AIMU and the different academic programs offered. Dr Ravi highlighted important features of the MD program at AIMU and mentioned the proposed modifications. Dr Cox in her address provided an overview of various student services available at AIMU and exhorted students to avail of these services as and when required. Dr Cox served as Master of Ceremonies for the morning session. Mr Dolor highlighted various physical spaces in the campus which should be utilized to a greater extent by students. He emphasized that AIMU has one of the best campuses in St. Lucia. Ms Cara provided an overview of student life with an emphasis on housing and the canteen. She described various festivals and cultural events celebrated by the students. Mr Augustine, President of the Student Government Association (SGA) described various interesting locations on the island of St Lucia and informed students about banks, restaurants, shops and other facilities available near the campus. Ms Sahana, provided insight into the various functions and roles of the Office of the Registrar and how students can avail of various academic documents. Dr Rose provided an overview of personal counseling services available at AIMU and exhorted students to utilize these services when required and not to be influenced by prevailing stigma with regard to seeking support. Dr Courage provided an overview of various career choices available to medical students and the course requirements for various specialties. He also discussed the licensing requirements for doctors in various countries. Ms Felix provided an overview of the school library and she mentioned that in addition to course textbooks, the library also has a good collection of novels and leisure reading. Dr Garg provided an overview of early clinical exposure and why it is so important. Fire and emergency personnel from the Gros Islet Fire Station talked about common issues regarding fire safety and how to protect the home and the workplace from fires. AIMU would like to thank them to taking the time to educate our students and faculty. After the lunch break, Dr Dakubo briefly presented about research at AIMU and about the recently introduced research module. Mr Augustine provided an overview of SGA and the various activities conducted previously and planned for the current semester. Ms Gbemileke, the Vice-President of the American Medical Student association (AMSA) AIMU Chapter talked about the chapter and its achievements. Mr Kareem from Scotia Bank discussed financial literacy with the students. Dr Tellamina was the Master of Ceremonies for the afternoon session. The program ended with distribution of certificates and letters to various participants. Certificates were distributed to the class stoppers with a GPA higher than 3, to student members of the curriculum committee and to students who have completed the health humanities module. The program concluded around 2.45 pm.